The Johnny Manziel experiment is over. The CFL terminated the former Heisman Trophy winner's contract with the Montreal Alouettes on Wednesday. The league also informed the eight remaining clubs that it wouldn't register a contract for Manziel if any tried to sign him. The league said Manziel had contravened an agreement that made the Texan eligible to play in the CFL. "We advised Montreal that Johnny had violated one of the conditions we had set for him to be in our league. And Montreal announced his release today," CFL commissioner Randy Ambrosie said Wednesday in Vancouver. "We didn't release the terms of those conditions then and we're not going to do that now. A posting to Manziel's Twitter feed indicated he was already looking for other opportunities south of the border. "I want to thank (Alouettes coach Mike Sherman), my teammates, and the CFL fans," Manziel tweeted. "My time there re-established my love for the game of football and the work that goes into it. I look forward to exploring new options within the United States." One option could be Alliance of American Football, which kicked off its inaugural season earlier this month. And Manziel said he was intrigued by the prospect of playing in either the AAF or Xtreme Football League, which begins operation next year. Ambrosie announced in December 2017 that the league would approve a contract for the former Cleveland Browns first-round pick, who at the time was on the Hamilton Tiger-Cats negotiation list. But Manziel had to fulfil certain requirements to join the league. The league's due diligence included an assessment by an independent expert on domestic violence and a head-to-head meeting between Manziel and Ambrosie. Manziel had sought treatment for anger management and alcohol abuse as part of his acquittal on a 2016 charge of domestic violence. Manziel eventually ended up signing with Hamilton in May 2018 but was unable to get on to the field behind starter Jeremiah Masoli. The Ticats dealt Manziel and offensive linemen Tony Washington and Landon Rice in a blockbuster trade with Montreal on July 23 for receiver Chris Williams, defensive end Jamaal Westerman and two first-round draft picks (2020, '21). The move reunited Manziel with Sherman, who also recruited Johnny Football to Texas A&M. Acquired to be Montreal's No. 1 quarterback, the 26-year-old Texan was 2-6 as a starter, completing 106-of-165 passes (64.2 per cent) for 1,290 yards with five TDs and seven interceptions. He also ran for 215 yards on 29 carries (7.41-yard average) as Montreal (5-13) finished third in the East Division but missed the CFL playoffs. Manziel was due a $75,000 bonus March 1 and scheduled to earn a $202,000 base salary in 2019. Manziel's departure leaves Montreal with five quarterbacks on its roster (Vernon Adams Jr., Jeff Matthews, Antonio Pipkin, Matthew Shiltz and Canadian rookie Richard Hugo). Pipkin appeared in six games last year, completing 78-of-131 passes (59.5 per cent) for 1,120 yards with eight TDs and three interceptions. Manziel's CFL action was his first in pro football since December 2015. He captured the '12 Heisman Trophy and was taken in the first round, No. 22 overall, in the 2014 NFL draft by the Cleveland Browns. But following two tumultuous seasons, the Browns released the Tyler, Texas, native in March 2016 after he posted a 2-6 record as their starter. Manziel appeared in just 14 games with Cleveland, completing 47-of-258 attempts (57.0 per cent) for 1,675 yards with seven touchdowns and seven interceptions. He also ran for 259 yards and a touchdown. Manziel had been out of football until signing with Hamilton. 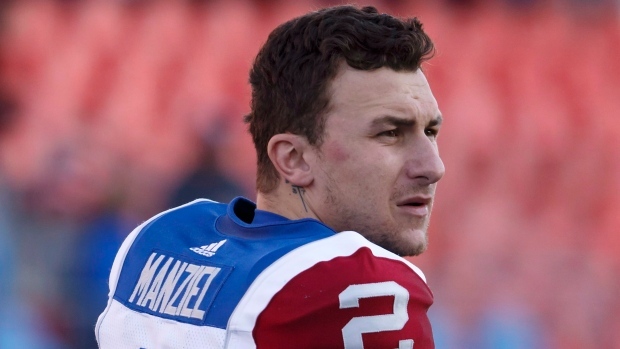 When Manziel joined the Ticats, head coach June Jones boldly gushed about Manziel's potential. "I think he'd be the best player to ever play up here," Jones said. "He can throw it and he can run it like nobody ever has been able to do."